Make it a double, toil and trouble…. Mix with ½ tsp flavored syrup until color dissolved. Add ¼ cup soda water (watch out, it’s extra fizzy with color!) and ¾ tsp lime juice. Mix with spoon. Add vodka to taste or enjoy as a mocktail with ice cubes. This Halloween enjoy a different kind of Candy Corn in the form of a delicious cake! 1. Follow the directions on the back of the cake mix and pour into 9” cake pan. 2. Once the cake is cooled, remove from pan and plate. 3. Divide frosting into three bowls. Add ¼ cup plain white frosting into first bowl and set aside. 4. In second bowl, add ColorKitchen Yellow packet and stir in ¼ tsp water to make a paste. Add ½ cup frosting and blend with a hand mixer with 1 beater attached until color fully blended. 5. In third bowl, add ColorKitchen Orange packet and stir in ¼ tsp water to make a paste. Add 1 cup frosting and blend with a hand mixer with 1 beater attached until color fully blended. 6. Take frosting knife and frost center circle of cake with white frosting 3” in diameter. Around white circle add larger yellow frosting circle about 3” in diameter. Complete frosting with outer circle of orange, to the edge of the cake. Frost sides of cake with remaining frosting. 7. Cut cake to make candy corn slices and enjoy! Line a 9 x 13 baking pan with parchment paper. In a mixing bowl, add the flour, baking powder and sea salt and whisk together. Set aside. In the bowl of your stand mixer fitted with paddle attachment, add the sugar, cocoa, chocolate chips, vanilla bean and water. Mix on low until combined and all the chocolate has melted. Add the egg, egg yolk, canola oil and the flour mixture. Mix on low until all ingredients are combined. Do not over mix. Pour batter into baking pan and spread evenly. Bake for 12-14 minutes or until a wooden pick inserted in center comes out clean. Once the brownies have cooled, remove from baking pan. Cut them into squares, rectangles or triangles. It’s fun to make them all different. Next, start the frosting. In the bowl of your stand mixer fitted with paddle attachment, add the butter, powdered sugar, vanilla extract and water. Mix on low until all ingredients are combined then speed mixer up to high for 1 minute or until light and fluffy. Separate the frosting into eight small dishes. Add the below colors to create different colors, and leave one dish uncolored for the eyes. Add each of the frostings into piping bags. Use tip #2 for the chocolate, tip #8 for the white, tip #32 for purple, tip #21 for pink, tip #133 for blue, tip #26 for orange, tip #48 for yellow and for green I just spread with a knife. 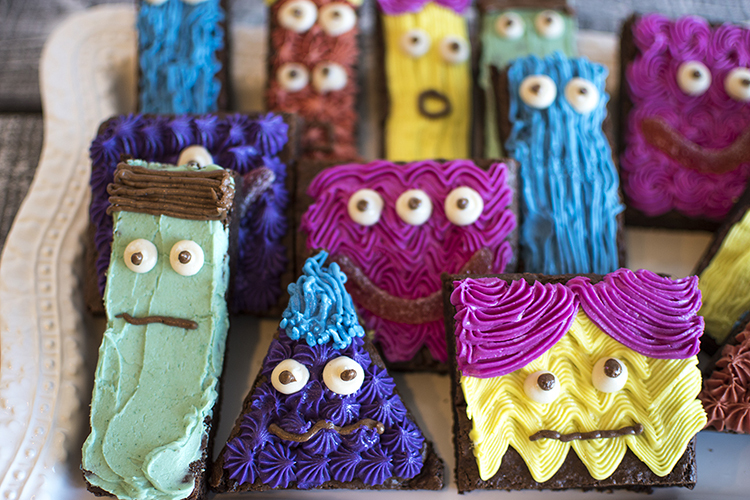 Once all the frosting is in piping bags, just pipe different designs on each brownie to create different kinds of monsters! This part is so fun because you can do anything! Once all the monsters are colored, add eyes by piping white circles onto each one. Then add a small chocolate dot in the center. Create mouths with the chocolate or with gummy worms, and add hair with any of the colors! Baker’s Note: To make these brownies gluten free, just substitute the organic flour for an organic gluten free flour blend.